When the Kudzu Kids made one of their regular visits to their friend Zina Jacinto, they found her distressed about the number of missing dog flyers at the pet supply store. "There are so many. Too many, it seems to me," Miss Zina told them. They vowed to help their friend and find out why so many dogs had disappeared. The first thing the Kudzu Kids did was go straight to the pet supply store where Miss Zina had seen the missing dog flyers. There, they talked to the store manager to see what he knew about the posters. Mr. Sampson told them they should talk to the local animal control officer, Riley Scott, who helps people get their lost pets back. At Officer Scott's suggestion, the Kudzu Kids next went around to local veterinary offices and to the animal shelter to ask if anyone had noticed more dogs being reported missing lately. Those conversations led them to Naomi Temple, a volunteer at the shelter who has her own take on the world and maybe a theory about Riley Scott. Later, the Kudzu Kids decided to make a map of all the places where the missing dogs lived to see if any kind of pattern emerged. Next, they followed up on a tip from one of the veterinarians, who said Joey Sims should have the info they wanted. Rachel and Zach talked to Joey to try to get some answers. 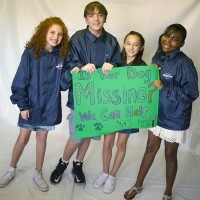 Using what they learned from their map, the Kudzu Kids set up shop in a place where they could talk to all the people whose dogs were missing. The first ones to approach them were Andy and Charlene Osborne, who were eager to talk about their missing dog, Butch. Mrs. Osborne had an unexpected theory about what happened to him. When he saw their sign outside, Franklin Guyton came in to talk about his dog, Champ, with the Kudzu Kids. Melody and Zach couldn't help feeling sorry for Mr. Guyton when they saw how sad he was. Lawrence and Kiki Wilson were more worried than sad about their dog, Taz. They said Taz required special attention, and they were concerned for his well-being in someone else's care. George Donnelly decided to ask the Kudzu Kids for help finding his dog, Bolt, even though he said he was already getting assistance from another source. The Kudzu Kids decided to find out more about Naomi Temple, so they went to her street and talked to her neighbors. Then with a little help, they were also able to talk to a few of Naomi's classmates from high school. When Ignatius and Sally Hamblett stopped by to talk to them, the Kudzu Kids found one spouse was more upset than the other over their missing dog, Tony. Vince and Quinn Preston also came in to ask for the Kudzu Kids' help finding their dog, Lois. Later, Emma and Melody visited Ophelia Rickard at her house so she wouldn't have to go out to talk to them about her dog, Lucky. Next, Melody and Emma went to see Ms. Rickard's friend Susan Starks to try to get to the bottom of the mystery about Lucky. Meanwhile, Rachel went to talk to Sarah Fogarty about her co-worker Joey Sims to find out more about him. Even though their dog, Newton, wasn't missing, David and Becky Young came in to talk to the Kudzu Kids because they had questions of their own. Once they got the security video from the Youngs, the Kudzu Kids took a close look to see what clues they could find. Then the Kudzu Kids took the video to their favorite teacher, Dr. William Lamar, to get his advice on what they should do. Following Dr. Lamar's recommendations, the Kudzu Kids talked to someone connected to the video and then visited the Youngs' home to look for evidence. 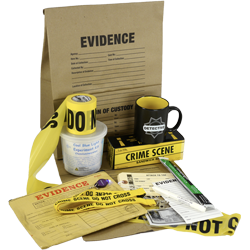 The Kudzu Kids took all the evidence they'd collected to Rachel's uncle, Detective Armstrong, and asked him to pursue the case. After their conversation with Det. Armstrong, the Kudzu Kids went to update Miss Zina. With renewed determination after their talk with Miss Zina, the Kudzu Kids set out to collect more evidence. They reviewed Miss Zina's list of suspicious vehicles that she'd seen in the neighborhood to see if they recognized anyone. Then they used a covert detection technique they learned from Dr. Lamar to try to find out who's been visiting the vacant house across from Miss Zina's. As part of trying to find out which of their suspects are involved in the dogs' disappearances, the Kudzu Kids went back to veterinary technician Joey Sims and to animal shelter volunteer Naomi Temple to get their reactions to a still image of the person in the security video. While Kudzu Kids Melody and Emma tried to get Riley Scott to answer some questions, Zach and Rachel were outside trying to find out if there was any theft detection powder in Mrs. Scott's vehicle. Later, the Kudzu Kids went back to Dr. Lamar to get his advice on how they could identify who left the footprint in the Youngs' flower bed. Shortly after they formulated their plan, the local gossip blog caught wind of it and helped spread the word. With Dr. Lamar's help, the Kudzu Kids put their plan into action to collect shoe impressions from their suspects so they could compare those impressions to the footprint cast from the flower bed. When the Kudzu Kids checked the webcam they'd set up at Miss Zina's to watch the vacant house across the street, they found something very interesting in the video. With that video and all the other evidence they'd collected in hand, the Kudzu Kids went back to Detective Armstrong and asked him to look into their top suspect in the dogs' disappearances. Upon reviewing the Kudzu Kids' evidence, Detective Armstrong asked Carl Asher to come in for a conversation to find out if Mr. Asher had any answers for the questions that had come up. After Detective Armstrong made an arrest in the case of the missing dogs, the grateful dog owners threw a party for the Kudzu Kids to thank them for all they did to locate the beloved pets. Go behind the scenes with these Detectives-only videos available exclusively to Crime Scene subscribers. Crime Scene 360 lets you see everything that's happening when a scene is being shot. Click and drag while the video is playing to find out what the director, crew, and others on set were doing when the Kudzu Kids were filming with Zina Jacinto and with Naomi Temple. And watch the Kudzu Kids prepare their performances as they work with their acting coach and rehearse with the casting director.